That is absolutely not the color I remember you buying, but it looks amazing! Nicely done, my friend. Now I know who to turn to when I finally find the right dressers. @JustHeather, I pulled a paint color switch RIGHT AT THE END. @Casey, Sneaky girl! I never saw it coming. I’ve wanted to do this for a while (because of Pinterest) but I can never find that perfect piece of furniture. It’s BEAUTIFUL and you did such a wonderful job! @Karen Sugarpants, Thank you! 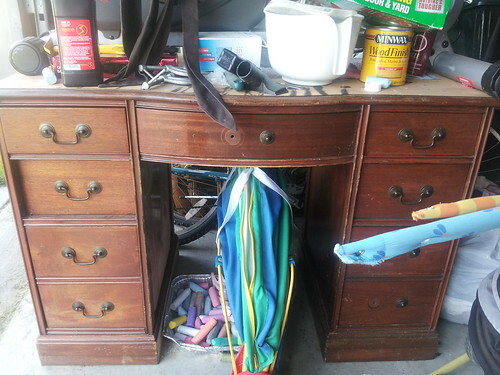 This desk was from a yard sale in our neighborhood, you’ve seen my neighborhood. I’m reading this while waiting for the final coat on a set of chairs to dry. 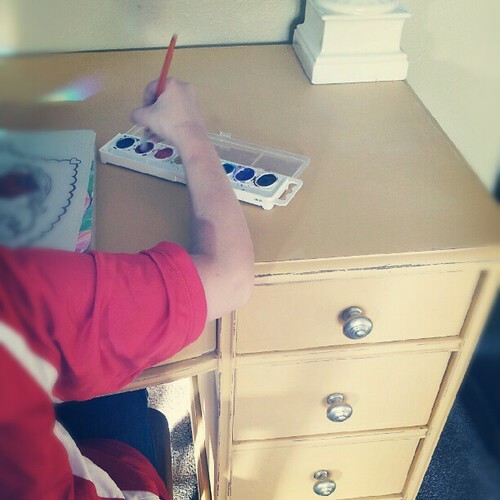 I also painted my coffee and end table blue and a garage sale lamp red. SO EXCITED ABOUT THIS CRAFTING! @Miss Britt, I WANT TO SEE ALL YOUR CRAFTY THINGS!! You are so crafty. Those of us who are about to die from jealousy salute you. @Ami, Pff, oh, I’m sorry, did my crafty get in the way of teaching your children about the Etruscans? Fantastic! It looks like something from Pottery Barn for hundreds of dollars! Nice job. @Alisa, EEE! Yay! Thank you!! Oh my GOODNESS, this is amazing! 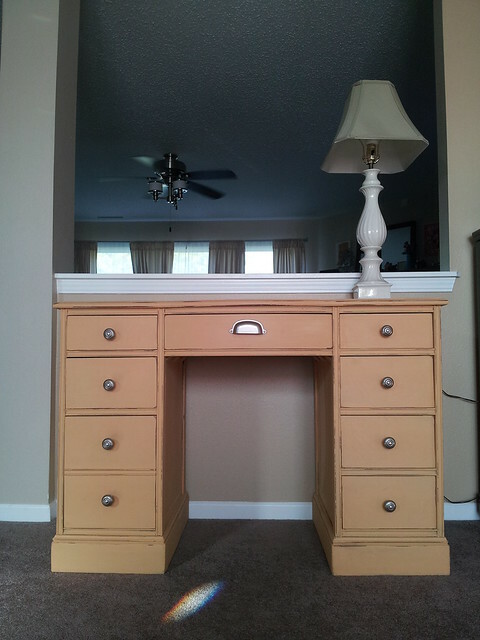 I’ve done several refinishing projects, but this is spectacular! 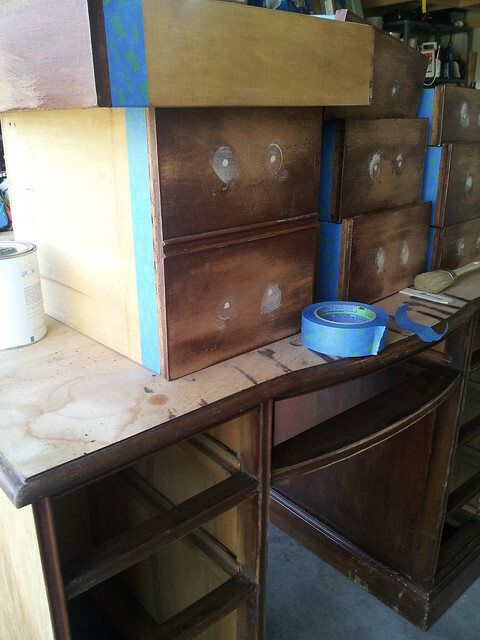 I currently have 2 unfinished Ikea nightstands just waiting for a crafty touch…. I’m just feeling a little scared. @ClassyFabSarah, Scared? It’s IKEA! LET’S CRAFT THE NIGHTSTANDS! I am so impressed that I’m about to die. Plus- I now want to paint my piano blue. @Mynde, Half of our garage is a mess, the other half fits my car. It’s an organized mess, but a mess all the same. I saw a photo of a blue piano and I’ve wanted one ever since. Very nice! I laughed out loud when I saw the putty b/c it DOES look like a flattened mouse. @KDA, It was there when we moved in, there may or may not be a mouse underneath. Yes, yes – ever since this: http://thepenningtonpoint.com/?s=pianos – and I don’t even OWN a piano…but if I ever find one on the cheap that needs some TLC, blue is it! Rock on, handywoman! LOVE projects like this – no male assistance required. In a non-judgmental aside, am I the only person on the internet who isn’t into the shabby chic look? My favorite stage of this was pre-distressing. However, as the goal was a shabby chic distressed piece, I do have to say that the sanding was well done and it looks like it is a real vintage paint job with years of use making it shabby, not something you just banged out last week with your crafty little self. I’ve been intending to redo the dressers in our room but I’ve been scared to actually, you know, DO it. Seeing posts like this is helping me work up the courage. @Della, Truth: I’m not really into shabby chic either. BUT this thing was already so beat up and so, let’s say, “FULL OF CHARACTER” that it had to be borked up on purpose, I either needed it to be absolutely PERFECT, or shabby. Thanks for the mention, friend. It turned out great! Love the new hardware. I’m starting an ASCP project this weekend. I got a sample and medium paint brush a couple months back, and they’ve been staring at me. I’m going to have to keep telling myself “brush strokes are OK” as I paint. We’ll see if I’ll be able to handle it. I’ve been reading your blog for a really long time and love it! This is my first ever comment! 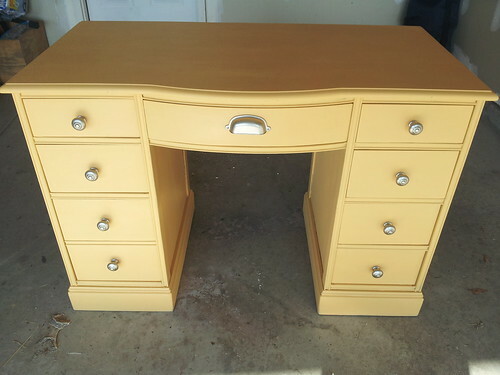 You did a fab job on this desk! I’m thinking if you wanted to, you could sell that baby for an easy $150 and get it! I LOVE IT! Um, love it. I think yellow is happy and we all need a little more happy. And the wood putty on the ground DID look like a flattened mouse. I’m glad you addressed that. So lovely! You did a great job and I’m inspired. I love that you wrote “boom”. It’s just another reason why were kindred. Beautiful desk Casey. Nicely done. Now, if only I could find something to refinish. I’ve been looking for AGES. You’ve done an amazing job, Casey. I love it!